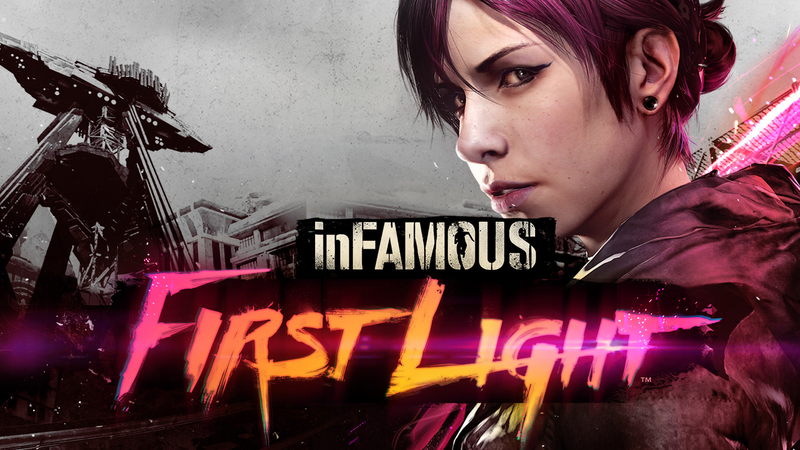 InFAMOUS: First Light is an add-on/expansion/DLC for the next-gen sequel in the InFAMOUS series, Second Son. Thanks to PlayStation Plus, I had First Light in my library and after my lengthy Dragon Age: Inquistion playthrough I have been playing a few shorter titles and enjoying a variety of games. I have always been intrigued by the InFAMOUS series. I own the first two games, one as a long past PS Plus selection, and the second as a cheap used game pickup. I had played a few hours of the original InFAMOUS, so I had a general idea of what to expect: unwitting person gets bestowed with unbelievable powers, and in the face of adversity can decide whether to work as a force for good or use their powers in incredibly wicked ways. It was an interesting concept, and fun to run around in an open world. Since I have not played Second Son, some parts of First Light did not resonate with me because I did not have that game to go on, but there is still enough to go on story-wise that will allow anyone to treat the game as a solid standalone release. WARNING: Could be a little spoiler-ish from here. The comment section is totally fair game though. Quick story synopsis: you play as Abigail “Fetch” Walker. She is a character from Second Son. We find her in a facility, in custody of an organization called the Department of Unified Protection. Fetch is a conduit, possessing and neon type of electricity. We only know that something terrible happened in the past. Through flashbacks we find out why Fetch is in the position she is in. We discover that Fetch and her brother Brent were trying to make their way from Seattle to Canada. Brent involved himself with gangsters to make that happen. The plan literally blows up, and Fetch has to put herself in league with Brent’s ‘boss’, Shane, who by holding Brent hostage manipulates Fetch by making her do his dirty work to set her brother free. Mayhem ensues, and eventually Fetch realizes that Shane will never let Brent go, and through trials and tragedy, leads to Fetch violently unleashing her powers (that she has tried to avoid using, because that is what Brent would want) and bringing and end to her dealings with Shane. That is what puts Fetch in the hands of the DUP. First Light’s sandbox is the city of Seattle. Obvious landmarks include the Space Needle and an approximation of the Pike’s Place market among others. If you have ever been to Seattle it has some of the flavor, enough to make it feel familiar. You can speed around town in a magenta, Flash-like blur, or leap and dash from rooftop to rooftop. If you have played an InFAMOUS game before, the control scheme will be familiar to you. First Light, being an dd-on, is not especially lengthy, so running around town and completing objectives pads out the main story line. If you are kind-hearted, you can look for citizens in distress and save them from gang members. If you are not discriminate about dispatching the criminals, you may end up killing the hostage. Other diversions are running through speed trials and tagging locations around town with spray paint. You also have to be careful not to antagonize the police, or they’ll be coming after you. They are not terribly difficult to avoid. When fighting the game’s baddies, you can hit them with a neon blast, or go for high speed melee attacks. It was fun stringing together combos and feeling near-invincible. Each blow feels satisfying, especially when you end up flipping vehicles and making them explode (who doesn’t like a bit of mayhem?). When you battle, you drain your neon capabilities, you have to recharge by finding a neon sign or billboard and drawn its power into you. You build up your powers by collecting Lumens, which are neon orbs that hover around town. Some are pretty high up so you have to get creative in getting to them. It’s frustrating at times. Once you do, you can upgrade as you see fit. When in custody of the DUP, they force Fetch into an arena where she must fend off robots and soldiers with increasingly powerful skills. As each phase is completed, it opens up new challenges that you can try in order to get high scores to reach the global leaderboard of other First Light players. It is a neat idea, but it was not something I had much interest in doing. Most of the game’s battles fall into the ‘fight waves of enemies’ category. You can generally get the upper hand by finding a spot of high and raining neon down at your enemies. There are occasionally snipers and rockets to deal with that give you some challenge. If there is something to criticize the game about, it is that the difficulty is not all that high. There were only a few occasions where I felt I was in danger of dying, and I only died a few times over the course of my playthrough. It does keep the game fun to breeze through over the course of an afternoon, but if you are looking for something to push your limits, First Light probably would not be a good fit for you. I would recommend the game for its use of an interesting protagonist and an intriguing (but slightly cliche) story, and playing in the open world (who has not wanted to run up the side of the Space Needle?). You do care about what happens to Fetch and her brother. The visuals are great. Fetch’s neon, bright-colored powers are striking and provide a great contrast to the Seattle backdrop, especially when it is overcast and rainy. The game also has Photo Mode, which is officially my favorite option in games these days. I will admit I spent no small amount of time in the game just taking photos. I enjoyed First Light. It was a good change of pace after playing Never Alone and Everybody’s Gone to the Rapture. It is a game version of a popcorn movie. Interesting enough to see it through to the end, but it is not one that you will be debating in your head for hours afterwards. Give it a go. Just make sure you stop and take a lot of photos along the way. All images besides the header were captured using the game’s Photo Mode.